You can quickly update all Splits and Dividends on an instrument list via the Instrument Lists window. Please follow the guide Adding Splits and Dividends for details on how to enableNinjaTrader to do updates on the selected instrument list. 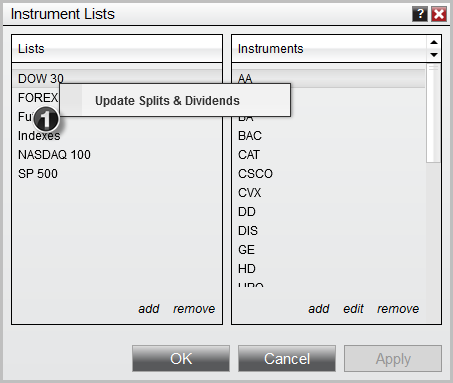 1.Right click on the Instrument List you want to trigger the mass update for and select Update Splits & Dividends. NinjaTrader will now request historical splits and dividend information from your provider and populate the information in your local database.